If you’re a Barça fan this should sound very familiar to you: it’s Sunday in the afternoon, you were at the movies. As you leave the theater and switch on the cell phone you get some messages about Real Madrid’s game. Real isn’t winning and there are just 20 minutes left. Don’t trust, but step into a bar to watch the rest of the game though. Let’s go, maybe there’s some good news on the way. 75 minutes and still a tie game, 80 minutes, 85 minutes, almost… but in the end Real Madrid scores, and you go home upset because of a game you were not supposed to have watched. Among the most common Barça supporters mantra’s, there is the one which says that Real Madrid scores last-gasp winners very often. What truth is there in this complaint? I’ve analyzed every single game of Spanish Liga since 1960 to shed some light on this intuition. The exercise lies in comparing the result of the games on three different moments with the final result. In other words, see which team was winning -or if the game was tied-, after 75 minutes, after 80 and after 85, and compare those results with the final one. Doing this I’ve been able to develop a won/lost points balance during the last minutes, coming from each of this three different moments. For example, let’s suppose that a team is trailing till minute 87 of the game, though the final result is a draw. This would mean a +1 on this balance. On the other side, the team who was winning would get -2 points. The results confirm the belief of Barça supporters: Real Madrid is by far the team who wins more points during the last minutes of the game. 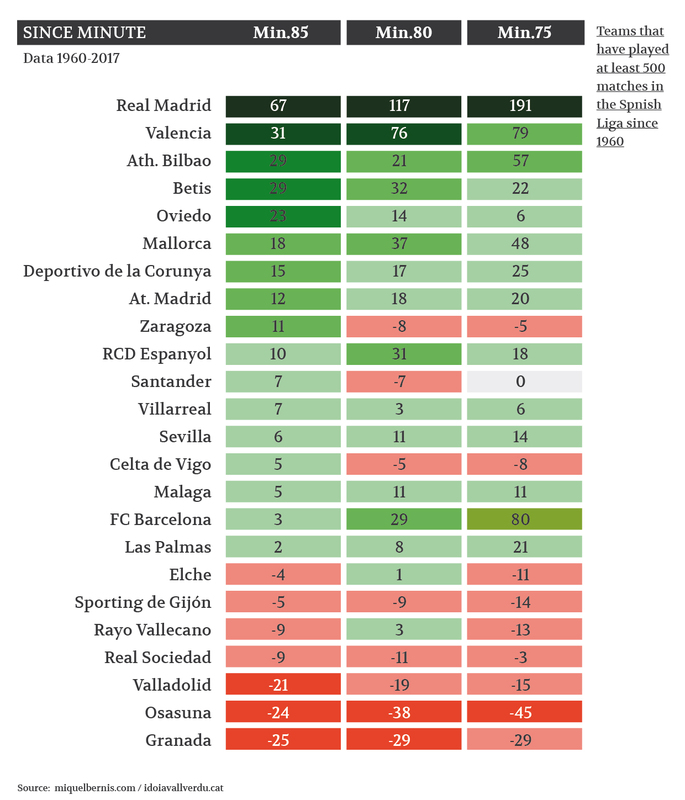 Since 1960, Madrid has made it to win 67 points during the last 5 minutes of the game, far behind it there is Valencia with 31, and Betis and Bilbao with 29. The result also says another important thing: the belief not only comes from the fact that Madrid is good on scoring last-gasp winners but also on that Barça performs very bad on last minutes of the game. Barça owns a balance of just +3 points, and has jumped into the positive figures just because earned +6 points on last season. In a mock league taking care only of the points earned or lost during the last 5 minutes of the game, Barça would be sat on the bottom half of it. Considering just the main teams in the league, only Real Sociedad would perform worst: the Basques owns a -9 points balance, considering the changes of the result in the last 5 minutes of the game. If we set the boundary at the minute 80 of the game, or at the minute 75, Barça improves. On a mock league of the last 15 minutes of the game, Barça would already be second, having less than half of Madrid’s points though. There is one thing that attracts attention, the more we get close to the end of the game, the more increases the difference between the two teams. 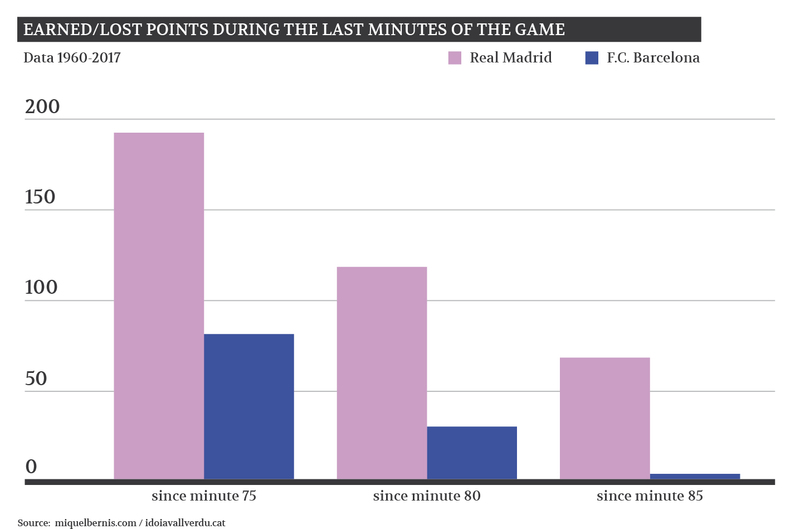 Figures of the 75-minute balance show that Madrid wins the double of points than Barça, considering 80-minute boundary, wins four times more, and considering an 85-minute limit Madrid takes 20 times more points. There’s another important question to ask: how it would change the league list of winners if we get rid of the last minutes of the game? The most stunning answer is that Barça would have won two more championships considering the games to last 5 fewer minutes. Altogether, 8 championships would have changed hands, 70/71, 76/77 and 83/84 Ligas would be on Barça’s museum, none of them would come from Real Madrid though. However, Madrid would have won one of Barça’s Ligas: the first of the back-to-back that were decided on the finish line at Tenerife (season 1991/92). Madrid wouldn’t have less Ligas on its museum according to that figure though, on the contrary, there would be one more. Among the most surprising Ligas that would change hands, there is season 2002/03, in which the team dressed in white resisted against the surprising Real Sociedad of Kovacevic, Nihat, Karpin and a youngster called Xabi Alonso. Real Madrid finished the championship two points over the Basque team (78 to 76), without the last 5 minutes of game Real Sociedad would have taken that Liga with an 8 points margin. The Ligas that would have changed of owner according to 80-minute balance are exactly the same, but staring at the last 15 minutes balance, Barça gets even more harmed. FC Barcelona would have won four more championships according to last 15 minutes balance, this time some of them coming from Real Madrid. In particular, one of the ‘la Quinta del Buitre’ Ligas (season 1988/89), the first of Cruyff as Barça’s coach. Real Madrid made 62 points on that season, Barça fell short by 5 (57 points). Not considering the last 15 minutes of each game Barça would have made the same number of points, Real Madrid would have got stuck at 56 though. Also Liga’s 2006/07 title would pass from Madrid to Barcelona. That one is especially remembered for the goal scored by RCD Espanyol’s player Raúl Tamudo at Camp Nou in the next-to-last match of the season, which combined with a goal almost at the same time by Van Nistelrooy at La Romareda Stadium left the championship almost on Real Madrid’s hands. The so called ‘Liga del tamudazo’ would be on Barça’s museum with no discussion (5 point margin) if we don’t consider the last 15 minutes of each game. Real Madrid won 8 points during the last 15 minutes of the game on that season. Almost always during the last 55 years, Real Madrid has been a winning team considering just the last minutes of the game, though temporal sequence comparing Barça and Madrid shows a clear period when the roles changed. During some years at the 90’s Real Madrid lost more points per season than the worst Barça seasons. A kind of hole that was quickly left behind. Barça’s bad run on the final stage of the games got broken on the last season (2016/17), in which made 6 points on last five minutes balance. Since 1960 just on 1996/97 Liga (second after the change from 2 to 3 points per win) Barça had made so many points in the last minutes of the game. Last season FC Barcelona won on the last gasp at Mestalla, at Vicente Calderón and so did on a home game against Leganés. Moreover, took a draw scoring last-gasp goals at Betis’s and Villarreal’s fields. Even there is one more game that Barça won on injury time which is not considered on this balance: Messi scored the third goal (2-3) at Santiago Bernabéu after minute 90, though those points aren’t considered because at minute 85 the game was on Barça’s side too (1-2). On the contrary, Madrid made two points on first leg game at Camp Nou, scoring the goal that tied the game at minute 90 (1-1).